I'm sorry to once again take the conversation to scalp territory, but here goes: My name is Tara Rasmus, and I have a high-maintenance head. The issues come and go, but my scalp very easily (and regularly) gets irritated, red, and flaky. While I've tried various products to solve this — I've found decent success alternating that lovely, gentle Klorane shampoo with decidedly un-lovely extra-strength dandruff shampoo — the flakes always return, leaving me grossed-out and frustrated. So, when I saw Alterna's newest scalp-specific product at a recent event, I could barely stop myself from running home to try it immediately. Here's what's so awesome about this nifty little product: It's an active-ingredient-packed gel (fruit enzymes for exfoliating, marine botanicals for moisture) housed in an innovative squeeze tube with plastic bristles on the end. So, to use it, you massage your scalp with the brush while squeezing out a bit of the treatment gel at the same time. As you can imagine, this feels totally awesome — and it leaves both your hair and scalp quite happy. The annoying thing about dandruff is that it's not only itchy and gross and totally annoying, but the buildup of dead skin cells can also block follicles and prevent healthy hair growth. So, while this brush is perfect for de-gunking your noggin of all things gross, it also clears these follicles and increases blood flow. Bottom line: It's awesome for your mane and scalp in the short and long term. So, the jury's still out on whether this product will give me a total hair makeover. But, for now, I'm enjoying my own personal spa treatment every few days — and I'm definitely psyched to banish that ugly bottle of dandruff shampoo from my shower once again. 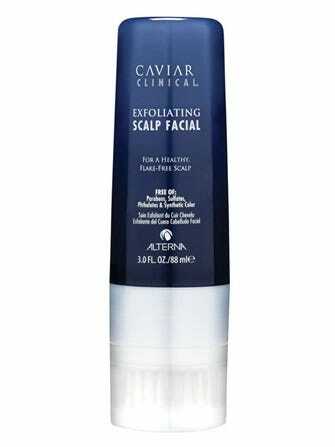 Alterna Caviar Clinical Exfoliating Scalp Facial, $36, available at Sephora.